The showcase of student talent at the Kirk Douglas theater on Saturday, Feb. 2, 1019 was marvelous, magical and motivated. Every department of the Academy of Visual and Performing Arts was represented in the performance of “The Art of Making Art,” an early peek at the kind of offerings that have been featured in previous years at the Java Gala. Putting this performance at the beginning of the semester put the creative pressure in all the right places, and the AVPA had plenty to be proud of. The AVPA has been a unique offering of Culver City High School for more than two decades, and the opportunity to sample the array of creativity cultivated there is always a treat. Representatives from the different departments – Pink Elephant Music Company, Blurred Vision Theater Company, Danger Zone Dance, Visual Art, Chamber Orchestra and Improv – gave some great performances in every category. Many departments worked together, with films featuring dancers, musicians joining in choreographed sets, and artists drawing live on canvas to the inspiration of jazz. An opening dance number gave way to a live jazz combo serenading artists at work on large scale drawings. The stop-motion animation of the film trailer “Don’t Leave Me Birdie,” directed by Thistle Boosinger led into a theater and dance collaboration “This,” created by Aliah Fabros. Thanks to the Center Theater Group, and specifically Eric Sims, was offered by Peri Reynaldo, succeeded by the Romanian Folk Dances of Bela Bartok, performed by the Chamber Orchestra, directed by Dr. Tania Fleischer. And that was barely the beginning. A film about dance led to a dance and live music improvisation with clarinet player Jake DeRiseis dictating the dance moves of Christy Jung, Ana Monterrosa, Andrea Lukas and Hanna Zhang. 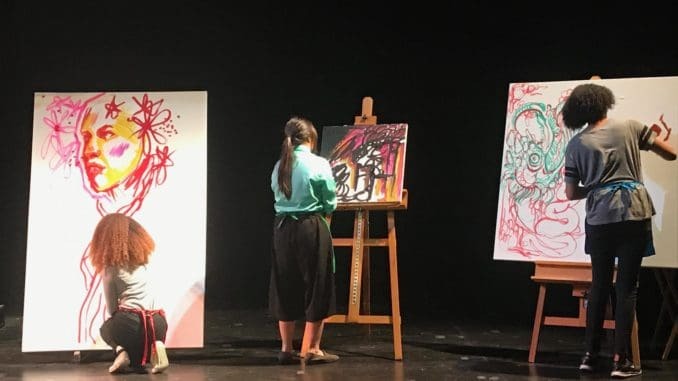 Blurred Vision Theater previewed the upcoming musical “Into the Woods” with two songs from the production, and Amalia Camey offered gratitude for the partnership with the Craft Contemporary that had give opportunities for the visual artists to study, create and learn. More Jazz and drawing segued into a few games with Improv, and spontaneous suggestions created comedy from the quick witted performers. The heartfelt film segment of students describing their AVPA experiences was directed and edited by Declan Sherk, Isa Berliner stood out with powerful vocals as the Jazz Ensemble took on the classic “Cry Me A River,” and a collaboration of film and theater written and directed by Metsehafe Henak, “Better Things” compared communication by text and talking IRL; results were positive. The evening closed with an eight minute cut of the musical “Wicked,” which had been Blurred Vision’s entry to the DTASC Festival last semester, and the traditional ‘all hands on deck’ bringing all 289 students to the stage for a loud and rousing rendition of James Brown’s iconic “I Feel Good” that had everyone dancing together for the finale. If any one department at AVPA seems to brim over with enthusiasm, creativity and talent, it’s a drop in the ocean compared to how much they all do together. The Java Gala will be held later this year at the newly renovated Robert Frost on June 8, 2019.